It would seem from the following letter from Katie Kehm Smith, Secretary of the Oregon State Secular Union that the State of Oregon is taking the lead of any of the other States of the Union in the organization of the Liberal minded people. For ourselves, we would much rather, that the words Free Thought were used in place of “Secular” but we suppose that is about what our Oregon friends mean. Free Thought is less sectarian as we understand it, than Secularism and in the new churches and new Sunday schools there should not be the least particle of sectarianism-creedism or exclusiveness. These churches should be built up on character and not on opinions or creeds. Each member should be perfectly free to hold to such opinions as his individual reason endorses. We have no doubt that is the case, and we congratulate our Oregon friends on the good work they are doing. 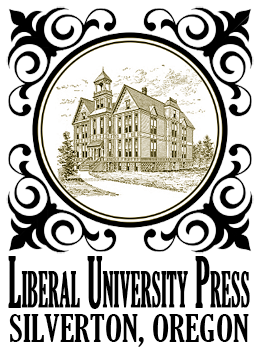 The grand movement, so well inaugurated in Oregon, we hope to see followed by Liberals in all the other States.—Editor. Our last entertainment given by the Silverton school is worthy of mention. Its chief feature was an operetta in two acts, entitled, “Seven Old Ladies of Lavender Town; or Prof. Lightning Haskins’s Wax Works,” by eight girls and eight boys from ten to thirteen years of age. Their acting and singing astonished everybody, and they won great applause. A character song, “I am a Peddler,” by Messrs. Ramsey, Wiles, and Towne, was unique and well rendered, while Pearl W. Geer got rounds of applause for his story of the woman “whose shoes were full of feet.” I recited Stephenson’s poem, “Our Father in Heaven,” and in response to a recall gave “Pyramus and Thisbe.” The last number, “A Good-night Drill” by eight little girls, was perfect. The success of the entertainment was mainly due to Miss. Sophie Wolf and Mrs. E. L. Smith. A dance followed the exercises, and a gratifying sum was realized for the Sunday school. The Silverton people are justly proud of their school. Miss. 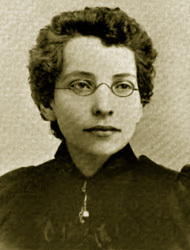 Wolf and Lewis Ames are the efficient teachers of the most interesting division, the Froebel Group of twenty-five members from three to eight years of age; Miss Bender of the Wixon Group; Mrs. J. D. Guiss of the Slenker Group; J. D. Guiss of the Progressive Bible Class. These are ex-school teachers. E. L. Smith, of the Paine Group, is the popular railroad agent of this place, and he is assisted by the Hon. T. W. Davenport, ex-State senator and father of Homer Davenport, the gifted artist of the San Francisco Examiner. The whole family of Davenports, from grandparents to grandchildren, are talented either as artists, musicians, writers or singers. I would match Silverton with any place in the country for brainy men and bright children. Silverton is a Secular town and has been for years, and there is nothing like the atmosphere of Secularism to develop brain and body. Since my last report the Wagner, Oregon, Secular Sunday school has been, organized, with thirty-five members and the following officers: William Crabtree Superintendent; Robert Carsner, Secretary; Maud Carsner, Treasurer and Librarian. The choir is composed of Mrs. Crabtree, Mrs. Purdin, Miss. Cason, and Messrs. Hugh Purdin, E. and G. Hayden, George Wagner, F. Hunt and Orson Martin. By a letter from the Secretary I am informed that the Christian Sunday school has about ten regular attendants. 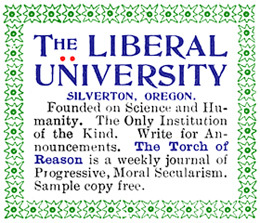 I have accepted an invitation to deliver the Fourth of July oration at Wagner, and want to correspond with Secularists along the route with a view to arranging for lectures and organizing Secular Sunday schools wherever I lecture, and will come prepared with constitutions, instructions, songs, poems, lessons, etc., and you will know how to conduct a Secular Sunday school before I leave. Please write at once, so that all arrangements can be made. I may also extend my trip to Harney county, and hope to hear from some of the friends there. Don’t write and tell me “there are only a few Liberals and we are afraid we cannot make a success of the school.” You can make a success of it. All that is required is a little energy, the expense is small. We want not less than a hundred Secular Sunday schools in Oregon before our next annual convention. The Seculists of Oregon will be glad to know that ex-Rev. E. C. B. Reynolds has been granted a license to lecture under the auspices of the Oregon Secular Union. At the last quarterly meeting of the Executive Committee licenses to the following named lecturers were renewed: Anna E. Barker, Nettie A. Olds and Katie Kehm Smith. Blank forms for quarterly reports of lecturers and superintendents of Sunday schools were adopted. The uniform price of $1 per month to each Secular Sunday school for its lessons, etc., was fixed and regulations in regard to appointment and resignation of lecturers were prescribed. Miss. Olds was assigned to the Portland circuit, Mrs. Barker to the Forest Grove, and Katie Kehm Smith to the Silverton circuit. Mr. Reynolds will try to organize a circuit at Astoria, Oregon, and another at Vancouver, Washington.